The Seventh United States Congress was a meeting of the legislative branch of the United States federal government, consisting of the United States Senate and the United States House of Representatives. It met in Washington, D.C. from March 4, 1801, to March 4, 1803, during the first two years of Thomas Jefferson's presidency. The apportionment of seats in the House of Representatives was based on the First Census of the United States in 1790. Both chambers had a Democratic-Republican majority, except during the Special session of the Senate, when there was a Federalist majority in the Senate. Ohio was admitted as a state, having previously been a portion of the Northwest Territory. 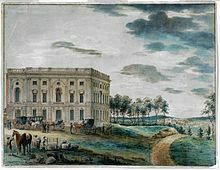 The exact date is unclear and in dispute, but it is undisputed that it was during this Congress. The official date when Ohio became a state was not set until 1953, when the 83rd U.S. Congress passed legislation retrospectively designating the date of the first meeting of the Ohio state legislature, March 1, 1803, as that date. However, on April 30, 1802, the 7th U.S. Congress had passed an act "authorizing the inhabitants of Ohio to form a Constitution and state government, and admission of Ohio into the Union." (Sess. 1, ch. 40, 2 Stat. 173) On February 19, 1803, the same Congress passed an act "providing for the execution of the laws of the United States in the State of Ohio." (Sess. 2, ch. 7, 2 Stat. 201) The Biographical Directory of the United States Congress states that Ohio was admitted to the Union on November 29, 1802, and counts its seats as vacant from that date. Although the Federalists had more Senators during the very brief March 1801 special session, by the time the first regular session met in December 1801, the Democratic-Republicans had gained majority control. Senators were elected by the state legislatures every two years, with one-third beginning new six-year terms with each Congress. Preceding the names in the list below are Senate class numbers, which indicate the cycle of their election. In this Congress, Class 1 meant their term ended with this Congress, facing re-election in 1802; Class 2 meant their term began in the last Congress, facing re-election in 1804; and Class 3 meant their term began in this Congress, facing re-election in 1806. Regardless of the uncertainty over Ohio's exact admittance date (see "States admitted, above") its two Senators were not elected until the next Congress. There was 1 death, 8 resignations, and 2 seats added for a new state. Massachusetts 14th Vacant Representative-elect George Thatcher declined to serve. ^ The official date when Ohio became a state was not set until 1953, when the 83rd U.S. Congress passed legislation retrospectively designating the date of the first meeting of the Ohio state legislature, March 1, 1803, as that date. However, on April 30, 1802, the 7th U.S. Congress had passed an act "authorizing the inhabitants of Ohio to form a Constitution and state government, and admission of Ohio into the Union." (Sess. 1, ch. 40, 2 Stat. 173) On February 19, 1803, the same Congress passed an act "providing for the execution of the laws of the United States in the State of Ohio." (Sess. 2, ch. 7, 2 Stat. 201) The Biographical Directory of the United States Congress states that Ohio was admitted to the Union on November 29, 1802, and counts its seats as vacant from that date. ^ a b Pennsylvania's 4th district was a plural district with two representatives. ^ "Seventh Congress March 4, 1801 to March 3, 1803". Office of the Historian, United States House of Representatives. Retrieved January 11, 2019 – via History.house.gov.